Play Count up with your DARTSLIVE CARD in the board and in rank 3rd, 33rd, 63rd, or 93rd place in the NATIONAL COUNT-UP Ranking! 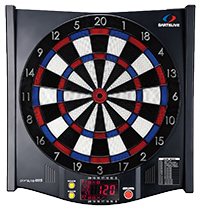 Also one Lucky person will win a DARTSLIVE 100S Home dart board just for playing COUNT-UP with their DARTSLIVE CARD in the board! That's right, it doesn't matter what your score is! Whoever scores the exact mystery number will win a DARTSLIVE 100S home dart board! Visit our RANKING page at this link to see where you rank!